The painting contractor is Joseph Hughes, he can employ up to sixty painters on a job. Here at Mount Stewart it is normally up to ten that are working each day, led by Sam, the foreman. Painting Mount Stewart is a bit different from your average house job! Brushes are used instead of the more normal rollers. 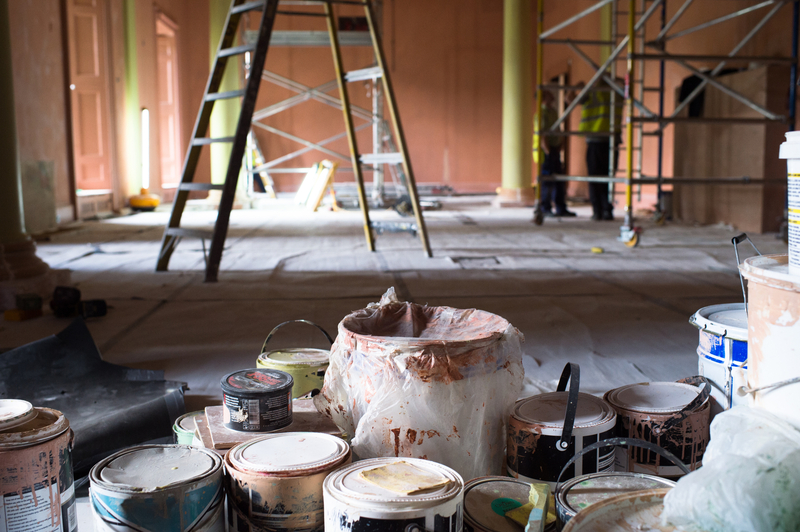 There are bespoke colour matches to be made and the painters contribute their skills and knowledge to help match previous paints used in the house. Sheen levels and finishes are carefully studied. Case and Distemper (which is being used) is an old type of paint with a chalky type; it is supplied by Farrow & Ball. Barry is the man doing the mixing, he looks at the colour, goes away and returns with the correct shade – or sometime two versions for Frances, our curator, to choose between. PJ Burns enamels the baths. Nichol Plaster Mouldings are working on the mouldings – especially in the drawing room. Tommy Stevenson of CDS does the lime plastering of walls and ceilings. Trade Mark Mason will be repairing the South Terrace. K Contracts have installed the new safety system up on the roof. Glass Marque are working on the skylights and have done a great job on the central hall dome.